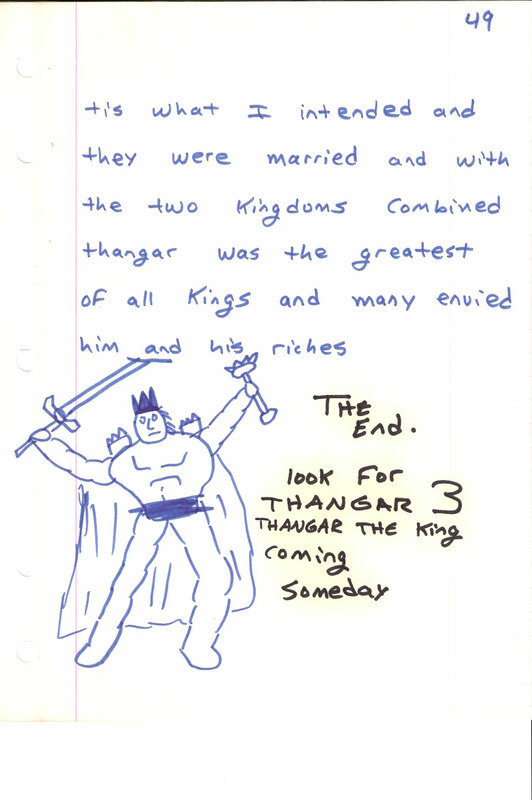 Thangar and the princess returned to his castle. A large welcome was held for her and Thangar’s safe return, with a large feast and song and dance, joy and happiness. Then one day, a great sadness came over the land. “I am sorry, but he is d-dead,” Thangar replied with sorrow. “He died for you and without him I would be dead also,” Thangar told her. “If he died for me, I will die for him also,” she said with tears. “NO! . . . But you can’t!” Thangar said. They were soon married and with their two kingdoms combined, Thangar became the greatest of all kings and many envied him and his riches. Closing Thoughts: With double extra cheese, Thangar 2 comes to an end. On second thought, calling this ending cheesy would be an understatement. I think it interesting how much of my beliefs are revealed in this one chapter. Like most 11 year olds, I struggled to understand adult themes like love and marriage, and as an 11 year old writer, it was especially frustrating incorporating it into my fiction. It’s one of those lessons I’ve come to learn only recently, in my thirties, that no matter how many books you read or education you have, you simply cannot fake life experience. If you’ve never been in love before . . . you can’t write well about it. Even if you mimic what others have done, it wouldn’t be genuine; it wouldn’t be art. Now that I’ve been married for ten years, struggled with family and finances, and know what it means to be a father (to two wonderful children) I find that I can better populate the worlds I create, with not only young, brash, idealistic heroes like Thangar, but more world-weary characters like Demacharon from Age of Aenya. If you’ve come with me this far, THANK YOU. What’s next? Well, three years after writing this story, I made my first attempt at getting published. At 14 years of age, I picked up a copy of Writer’s Market, picked three publishers, and sent out three copies of a manuscript entitled, Dynotus’ Adventures. Of course, I only heard back from this one agent, but that didn’t stop me from writing Dynotus Adventures 2, 3, 4, 5 “The Metal God” and my first novel starring Dynotus, The Nomad.